A high school student walks down a dark hallway in a public high school in Concord, California. The negative impact of vouchers on student achievement is equivalent to missing out on more than one-third of a year of classroom learning. How bad are school vouchers for students? Far worse than most people imagine. Indeed, according to the analysis conducted by the authors of this report, the use of school vouchers—which provide families with public dollars to spend on private schools—is equivalent to missing out on more than one-third of a year of classroom learning. In other words, this analysis found that the overall effect of the D.C. voucher program on students is the same as missing 68 days of school. The analysis is timely given President Donald Trump and Education Secretary Betsy DeVos’ main education priority: to privatize education by creating and expanding voucher programs nationwide. In the Trump budget released in February, the president has suggested doubling investment in vouchers.3* But while President Trump and Secretary DeVos often assert that research backs their proposals, the evidence is lacking. To be clear, the far-reaching negative effects of factors such as feeling unsafe in school cannot be overstated. For example, there is a large body of work that discusses the negative impact of exposure to violent crime on children’s well-being, including academic performance.5 Certainly, many of these factors are serious and are known to have a negative impact on multiple areas of child development. However, the comparisons made in this report focus only on how each in-school factor—violence at school, feeling unsafe, teacher turnover, and teacher absenteeism—affects school achievement. Further, using the Center for Research on Education Outcomes (CREDO) formula, the authors of this report also found that the overall effect of the D.C. voucher program on students is the equivalent of 68 fewer days of schooling than they otherwise would have received had they remained in their traditional public school. In other words, the students who participated in the D.C. voucher program lost more than one-third of a year of learning.6 To be clear, translating this effect into days of learning is an approximation intended to help assess relative impact. In this case, 68 days lost is clearly substantial lost ground for students participating in the D.C. voucher program. Importantly, the authors’ comparisons rely on both a selection of rigorous, recent voucher studies with test score impacts and one rigorous quasi-experimental study for each comparison topic. That being said, using alternative studies could lead to different results. The methods for selecting both specific voucher studies and comparison studies to add context are detailed in this report’s Appendix. Finally, the evaluation of the D.C. voucher program so far assesses one year of achievement data and future findings may be different. However, these findings are very similar to those from other longer-term voucher studies, which are described in this report. Caveats aside, the negative achievement outcomes of voucher programs uncovered by recent studies have not deterred the Trump administration;7 its stance on vouchers exemplifies a larger tendency to a dismiss evidence that does not align with the administration’s priorities.8 This dismissal of evidence plays an unfortunate role in both undermining the nation’s public schools and confusing parents who seek access to high-quality public school options. Earlier studies of voucher programs appeared to show some promise. Many of those evaluations—in New York City, Dayton, Ohio, and Washington, D.C., as well as in the states of Florida, Minnesota, and Louisiana—reported a modest increase or neutral impact on student achievement and graduation rates.9 The findings of some of these studies, however, have more recently been called into question as methodological flaws were discovered when adding additional years or replicating the study.10 As a result, recent voucher program evaluations employ more rigorous research methods such as experimental and quasi-experimental designs and refine their use of certain variables. These design changes and data additions allow for more stable and definitive interpretations of the results. More recent evaluations of voucher programs in three states—Indiana, Louisiana, and Ohio—have all come to similar conclusions and show that voucher programs have negative or neutral effects on student achievement.11 Importantly, all impacts described in this report are relative to public schools. Unlike other experimental designs where participants may receive a placebo or the intended intervention, the intervention in these cases is a private school voucher and the comparison is a traditional public school. Therefore, on the whole, these results show that relative to their peers in public schools, students in voucher programs are losing ground. The latest evaluation examined the outcomes of students using vouchers in Indiana for two, three, or four years between the 2011-12 and 2014-15 school years. The Indiana study has the largest sample size—and the largest voucher program—across all studies examined in this report. More than 34,000 Indiana students received vouchers in the 2016-17 school year.12 The study used a matching methodology to compare the test scores of students who transferred to participating voucher schools with similar students who remained in public schools. It found that students who used vouchers did not see academic gains in their new schools and that they performed worse, on average, than their matched peers in the public schools that they left. Finally, there is some evidence that the performance of students in public schools increased after the creation of voucher programs—as was the case in Florida and Ohio during the implementation of voucher programs in those states.27 However, it is unclear why these modest increases occurred.28 Nonetheless, these recent rigorous voucher evaluations showing substantive academic losses for students who do participate in voucher programs serve as a heavy counterpoint to these modest results for students remaining in public schools. Enacted in 2004, the D.C. voucher program provides publicly funded vouchers for low-income families who have a school-age child and reside in Washington, D.C. Eligible families receive vouchers through a lottery process. Families can enter the lottery if they meet program eligibility—D.C. residency and a household income at or below 185 percent of the federal poverty line. The district gives priority based on a few factors, including attendance in a low-performing public school and siblings in the program. If a student is selected, the family can apply and enroll in private school or decline and remain in a public school.30 About 70 percent of families who are offered a voucher choose to enroll in a private school.31 The D.C. voucher program accepts about 600 students per year.32 Once you receive a voucher through the lottery, you are eligible to continue with the program until graduating high school. These results mean that in math,38 the 1,166 participating voucher students fell behind their peers who remained in public schools, despite an annual federal investment of $60 million in the D.C. voucher program. Both groups of students performed similarly in reading.39 Notably, this study only analyzes one year of impact data; however, the results are in sync with the recent longer-term findings discussed above in Louisiana, Indiana, and Ohio. IES’s study of the D.C. voucher program is an important addition to existing voucher research. While there are voucher programs available in 13 other states,40 the D.C. Opportunity Scholarship Program is the only voucher program with a congressionally mandated evaluation.41 IES worked in partnership with Washington, D.C., to structure the voucher program as a randomized controlled trial so that researchers could use the most rigorous scientific research method—an experimental design—to evaluate outcomes.42 Researchers call experimental designs the gold standard because they leverage random, lottery-based assignment of students to either the treatment or control group—voucher schools or public schools, respectively—to more accurately assess the difference between the two groups of students.43 While these types of studies can be more expensive and cumbersome to implement, they largely provide methodologically unassailable results. This change does not affect the ongoing D.C. voucher evaluations that are already in progress—namely, to explore the long-term effects of D.C. vouchers, including graduation rates. All future evaluations of the federally funded D.C. voucher program will therefore employ methodologies with more limitations, making it more difficult to definitively interpret results. As a consequence, the findings of the most recent evaluation of the D.C. voucher program using the experimental method is now even more important to consider in the ongoing voucher program debate. The authors of all four recent voucher studies—in Washington, D.C., Louisiana, Indiana, and Ohio—have suggested some theories for the decline in student achievement, such as capacity and loss of instructional time. Of these three, only the instructional time factor proved to be a likely cause. As in the 2010 evaluation, the researchers found that private schools offer less instructional time than public schools. On average, private schools offer 65.5 minutes less per week in reading instruction and 48.3 minutes less per week in math instruction.48 More quality instructional time is linked to higher student achievement.49 Therefore, with each additional year that students are enrolled in the voucher program, they lose even more instructional time. The comparable results are meaningful and startling. The impact of attending a participating D.C. voucher school on math achievement is a larger decrease than all other factors that the authors reviewed. A public school student who is average in math—in the 50th percentile—declines to the 45th percentile after participating in the D.C. voucher program for one year. An average math student who experiences high teacher turnover drops from the 50th percentile to the 48th. 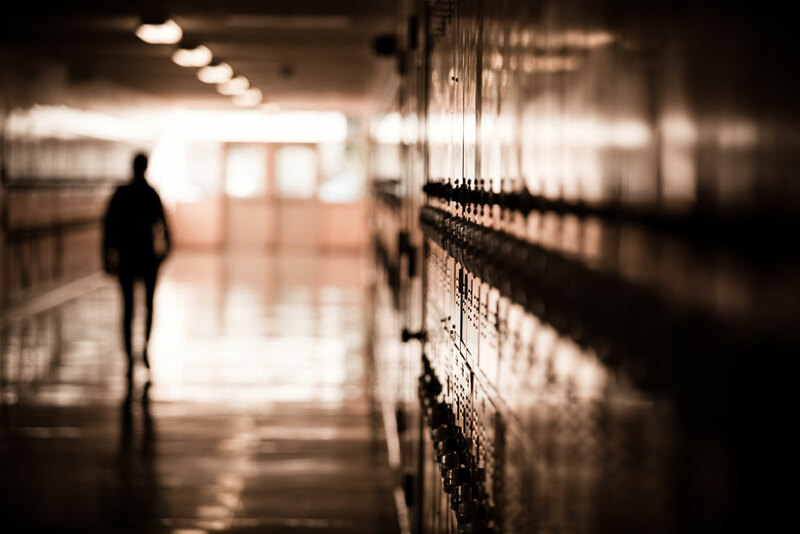 Feeling unsafe in school, experiencing at least 10 teacher absences, and exposure to school crime have the same equivalent effect, dropping to the 49th percentile. A decline in percentile points means that students are substantially falling behind relative to their performance in public school or relative to their similar public school peers, depending on the study. All the losses associated with these different detrimental interventions are significant. And yet, this comparison shows that students attending a voucher school experienced the largest relative learning loss across all five studies of negative impacts. Further, using CREDO’s days of learning conversion, this standard deviation unit decrease is the equivalent of losing 68 days of learning—more than one-third of an entire school year.57 This conversion assumes that students learn, on average, the equivalent of one-quarter of a standard deviation unit—0.25—per year. It is important to note that each study that the authors used only evaluates the impact of one factor in student achievement, when in reality, students are exposed to a variety of environmental and other factors, many of which have the potential to affect test scores. Therefore, it is possible—and likely—that students are exposed to more than one of the negative factors. For example, a student who witnesses violence in school may also feel unsafe in school. Further, when comparing these effects with the impact of participating in a voucher programs, it is also possible that students in both public schools and voucher programs experience additional impacts from some of the factors described in these comparison studies. However, there is no overwhelming evidence that would suggest bias in this comparison; there is no reason to believe that these known factors—teacher turnover, absenteeism, feeling unsafe in school, and exposure to violent crime at school— would occur more in the private sector versus the public sector or vice versa58. As noted above, this analysis uses only one rigorous, well-regarded study on each topic. Therefore, using alternative studies could lead to different results. The methods for selecting both specific voucher studies and comparison studies to add context are detailed in the Appendix. Selection criteria included rigorous methods, recent results, and studies that are representative of their field. The statistical significance; negative or positive sign direction; and magnitude are similar to other rigorous studies addressing these topic areas. In some cases, other similar studies may find an effect in reading but not in math, for example, but maintained the same sign, as well as similar significance and magnitude. This comparison focuses on math impacts only to allow for an aligned analysis of effects. 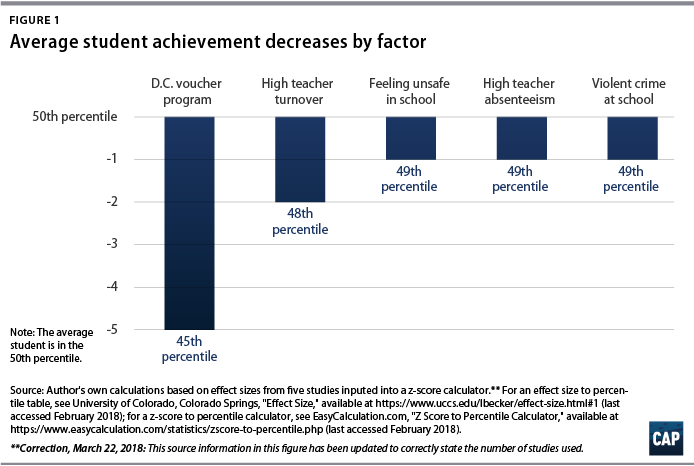 Further, the evaluation of the D.C. voucher program only assessed one year of achievement data; however, these are similar to the longer-term impacts found in the other three recent rigorous studies compared here. Ultimately, this comparison shows that the negative impact of the D.C. voucher program exceeds the impact of other factors which society deems harmful. While all reported successes of voucher programs should be further explored, including impact on graduation and college attendance rates, this research does not discount their significant troubling effect on student achievement. Statements such of that of the U.S. Conference of Catholic Bishops show that many voucher advocates recognize that using achievement to evaluate the worth of voucher programs would likely hurt their potential for growth. Rather than addressing the root of the problem—voucher programs leading to large student achievement declines—proponents hope to sweep the issue under the rug. Boosting student achievement is vital for America’s future.66 Raising outcomes in the nation’s school system will both maximize the potential of every child and foster the skills of tomorrow’s workforce. While choice in the education sector can spur innovation and offer parents and children options to best meet individualized needs, evidence indicates that voucher programs do not improve results for students and will not achieve that aim. Indeed, vouchers will likely hurt student growth and lower overall outcomes.67 Moreover, as low-performing and low-income students are often overrepresented in voucher programs,68 students with the greatest need will likely experience preventable declines in student achievement. Unfortunately, President Trump and Secretary DeVos instead aim to divert public funding to fuel the expansion of voucher programs.70 If evidence indicates that vouchers are worse for students than many other factors that society believes are detrimental to student growth and achievement, how can the federal government condone, let alone allocate, scarce funding resources to promote private school vouchers? CAP translated and compared the effect sizes of six studies in varying topic areas to provide the context needed to aid in interpreting these impacts. Importantly, two distinct processes guide the authors’ methods: study selection and converting effect sizes to percentile changes and days of learning. The voucher studies included in this report are the four most recent and rigorous voucher program analyses to be released in the past five years. Other work analyzing voucher program effects has similarly divided these four current studies from prior work.71 The specific focus of this brief is the study of the D.C. voucher program. The D.C. voucher program was selected as a study focus for this report due to the federal investment in the program; the federal mandate for the IES to study the impacts of the program; and the randomized control trial methodology used to investigate its impact. These three factors make the D.C. voucher program an important lens for education policymakers and practitioners to understand and use when considering investment in this program or similar programs. However, all four studies of voucher programs included in this report leverage rigorous—either experimental or quasi-experimental72—methodologies and are similarly important for education policymakers and practitioners to understand. Importantly, all four studies also have similar findings of negative impacts on math scores and in one case, on reading scores as well. These studies serve to further validate the impacts found in each individual study. This corroborating evidence is notable, as the D.C. voucher program only assessed one year of achievement data; however, the results are comparable to the other three current studies described. The additional five current studies with negative educational impacts described in this report, which serve to add context to the voucher study impacts, were all selected based on four parameters: the presence of in-school factors associated with negative impacts, rigorous methods, recent results, and representative of their field—that is to say, the statistical significance; negative or positive sign direction; and magnitude are similar to other rigorous studies addressing these topic areas. In some cases, other similar studies may find an effect in reading but not in math, for example, but maintained the same sign, and similar significance and magnitude.. The comparison in this brief focuses on only math impacts to allow for a comparable analysis of effects. Importantly, this analysis uses only one rigorous, well-regarded study on each topic. Therefore, using alternative studies could lead to different results. This translation to a percentile change from the 50th percentile allows the authors to make more easily understood and accurate comparisons across studies. For example, as stated in the paper, the D.C. voucher program had the average effect of moving students from the 50th to the 45th percentile, while not feeling safe in school had the average effect of moving to the 49th percentile. It is important to note, however, that the standard deviation to percentile conversion is not linear, therefore, these percentile changes must always be in reference to a starting point, in this case, the 50th percentile. Ulrich Boser is a senior fellow with the Center for American Progress. Meg Benner is a senior consultant with the Center for American Progress. Erin Roth is a senior policy analyst with the Center for American Progress. The authors wish to acknowledge several people who helped with this report. We would like to thank Austin Nichols, principal associate at ABT Associates, Johanna Lacoe, researcher at Mathematica, and Dorothyjean Cratty, independent research consultant, who each reviewed a draft of this report and provided valuable comments that strengthened the framing and interpretations. Lindsay Bell Weixler, associate director and senior research fellow at the Education Research Alliance for New Orleans, and Terris Raiford Ross, senior director of research and support at Leadership for Educational Equity, both provided helpful methodological recommendations and input. The findings, interpretations, and conclusions expressed in this report—and any errors—are the authors’ alone. *Correction, March 20, 2018: This report has been updated to reflect the timeline of the Trump budget released in February.